Mark Smith in Cardiff Devils action. 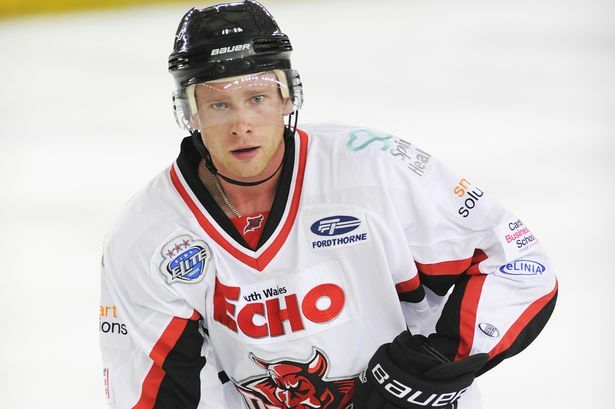 Former Cardiff Devils defenceman Mark Smith is the new coach for National Ice Hockey League club Cardiff Fire. Canadian Smith, whose brother Kenton also played for Devils, takes charge for this Saturday’s NIHL home match against Romford Raiders at the Viola Arena in Cardiff Bay (6.30pm). Fire’s director of hockey Mark Cuddihy decided to make a coaching change after the team made a mixed start in Division Two South. A statement by the club read: “Cardiff Fire have made the decision to part ways with player-coach Chris Douglas. “The netminder was brought in this past summer to take the helm, but Fire have made the decision to move in another direction. Director of player development Smith now takes responsibility for coaching and Cuddihy said: “These decisions are always difficult, but I feel it suits all parties. “Chris was becoming much busier with his day job and travelling a great deal to cover both roles. I am delighted he will be sticking around and helping Cardiff juniors. “We are lucky that Smitty has agreed to combine the two roles. Having worked with Mark last season I know the guys will have to react and work hard as we look to improve our league position. Experienced goaltender Douglas, a former Cardiff Rage player, was appointed head coach at the start of this season, after playing for Slough Jets over the previous two years. Now Douglas has moved on and Smith will head up a coaching team which includes Cuddihy and Phil Manny. Smith joined Devils in 2010 from Edinburgh Capitals. He had developed through the Alberta Junior hockey League, playing in 238 games and scoring 116 points before joining University of Alaska in the NCAA, the top college league in North America. Smith spent four years in NCAA hockey, playing 129 times and scoring 47 points. The man from Edmonton played for Charlotte Checkers (East Coast League) and Rocky Mountain Rage (Centre League) before heading to Britain. He played for Edinburgh, Cardiff and Coventry Blaze in Elite League, making 252 appearances, and was consistently among the leading shot blockers in the UK. Swindon Wildcats were his next club, but an injury meant he stopped playing and started a coaching career. “I didn’t plan a move into coaching when I was playing, but when my playing career ended I realised the itch to stay within the game was there,” says Smith. “I am confident in my abilities to help the Fire achieve success. I was always a player who brought 100 per cent to each and every game and training session. Cardiff Fire take on Romford at home this Saturday. Cardiff Fire’s Phil Manny. Pic: James Assinder.